Perhaps the biggest attraction on the drive from Brisbane to Cairns is Fraser Island. 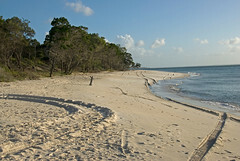 Fraser Island is a UNESCO World Heritage Site and holds the distinction of being the worlds largest sand island. If you look at a map of Australia, you will notice that the east coast of the country curves. 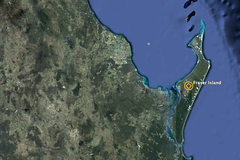 Right after the point where it bulges out the most and starts to curve westward, you will find Fraser Island. I bring this up because Fraser Island is, on a very large scale, the result of the exact same phenomenon which creates sand spits and sand bars. Given the nature of the ocean currents around the east coast of Australia, sand is constantly transported up the coast. At the point where Fraser Island is, is an extinct volcano. Today you can barely see it because it is covered with sand, but you can see basalt peek out at a few places on the beach. The sand which was transported up the coast basically got stuck on that volcano and started to pile up. Looking at an aerial photo of the island, you can see how the shape of the island is defined by sand getting extended down the island making it longer. 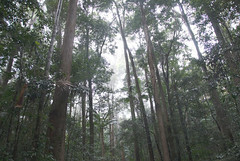 Although you have forests growing, you also have sand dunes which are being created as sand blows around. 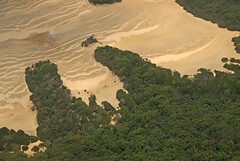 From the air you can see large rivers of sand encroaching into the forest. The island is a constant fight between forest and sand. Being the worlds largest sand island also sort of makes it the worlds largest sandbox for adults. Getting to Fraser Island requires about a 45 min ferry ride from Hervey Bay. Hervery Bay is about three hours north of Brisbane by car and is the launching point for everything Fraser Island. All the vehicles on Fraser Island have to be 4×4’s. I’m not sure if this is a law or just reality. Attempting to drive on the island with a normal car would probably be impossible within the first 100m of getting off the boat. You can rent your own car to explore the island or you can take a multitude of packaged trips. I took a day tour, which in hindsight, was probably not a great idea. Most of the day tours I’ve taken on my trip have been with very small groups and a guide. This one had 28 people and a bus (albeit a 4-wheel drive bus) and it really felt like I was on an assembly line. If I were to go back I think I’d rent a car and camp on the island for a day or two. You can fish on the beach and there are plenty of places to camp. You can drive right on the beach as well as many of the roads which crisscross the island. Getting a tour or renting a car is pretty easy if you can just get to Hervey Bay. Like most tourist towns in Australia, every hotel, bar, and store will have a desk where you can book tours. They pretty much beat you over the head when you get there. One thing which is heavily promoted is the dingoes on Fraser Island. While I didn’t see any when I was there, there is a population of dingoes on the island which are slightly different in breed from dingoes on the mainland. There are signs all over warning people about the dingoes and provide advice on what to do if you encounter them. I was told, and I don’t know if it is true or a rumor they tell tourists, that a 14-year-old boy was killed several years ago by a pack of dingoes. While traveling in a bus with 28 people wasn’t my idea of fun, an opportunity did present itself on the island that I took advantage of. There are pilots on the island who do short flights right from the beach. You can get out of your bus and meet up with it further up the island after taking a 15 min spin. I figured “what the hell” and plunked down the money for a flight so I could get some interesting photos out of the day. 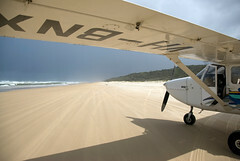 I am told that Fraser Island is one of the few places in the world where planes can take off and land on the beach. It was easily the smallest plane I’ve ever flown in and you can really get a feel for turbulence when you are in a plane that small. 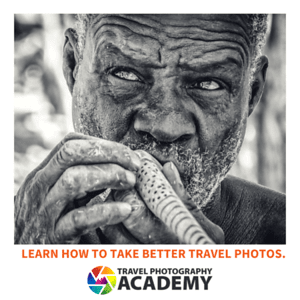 I was glad I did it and the photos I got made me do something similar in the Whitsunday Islands when I took a helicopter out to the Great Barrier Reef. Fraser Island is definitely worth seeing if you are in the area. If I had to go back, I’d rent my own vehicle and explore the island by myself over two days, camp and fish on the beach. very cool that you got to ride in a little airplane. i can just imagine the turbulence! hope you don’t get motion sickness. Yep a 14 year old boy actually did get killed by dingos. The problem is that people are feeding them and they are becoming less scared of humans. When I was in Australia, I went to Fraser Island. It’s pretty awesome. We went and had a picnic, and swam in a lake on the island. It was freezing, but the water was crystal clear. great place to visit… I also just love the blog you have. interesting pics as well as layout!